Large holiday home in Granzow (Mirow) - Nemecz Andrea "Entenhausen"
Property 65: Large holiday home in Granzow (Mirow) - Nemecz Andrea "Entenhausen"
Comfort house Useriner See in the Müritz National Park with 2 boats, WLAN incl. 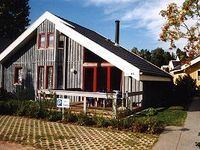 Property 84: Comfort house Useriner See in the Müritz National Park with 2 boats, WLAN incl. Landlust Bergsdorf - pure relaxation! Property 85: Landlust Bergsdorf - pure relaxation! 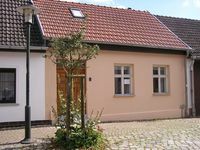 The house was charming, clean, well equipped, and comfortable with fine attention to detail.The outside space was well maintained and even though the house is located within the town of Gransee, outside was quiet and peaceful. The owner was friendly, and made sure that our arrival was welcoming. Gransee itself is a lovely old town with cobble-stoned streets and much history including a medieval cloister and church which are less than a minutes walk from the house. The church holds summer concerts, and there are nearby cafe/ bakeries, as well as two supermarkets within walking distance. There is a train station about 1.5 km away that serves Berlin city centre (journey time is about 50 minutes) with trains departing hourly. An adult day ticket for the return train trip and service on Berlin's underground cost 13.80 euro. Outside Gransee there are many small towns, nature trails and lakes that can be reached by car or bicycle. Thus Gransee can offer the peace of a small town, with the option of countryside and city excursions - a very pleasant getaway that can cater for diverse interests. Wir waren mit der Unterkunft, der Abwicklung und der ganzen Anlage sehr zufrieden. Eine sehr sch&ouml;ne Zeit.